It seems like there have always been complaints about parking here in Rio Crossing, but lately this issue has gotten a lot of publicity – much of it negative. Here’s a well-researched guide to the official rules. Having seen some of the emotional responses from people, I wanted to take a look at just the facts relating to parking in our community. Here is a summary of the government related rules, with duplicates consolidated and non-relevant sections removed. The text is paraphrased slightly for ease of reading, and duplicates have been consolidated. If you want to see the source for these, I’ve copied references to the Arizona statutes and Avondale code at the end of this page. Displaying a vehicle for sale. Washing, greasing, or repairing the vehicle. Displaying advertising or commercial exhibits. If anyone finds a vehicle parked in violation of any of the above restrictions, your recourse is to call the Avondale Police Department, preferably at their non-emergency number of (623) 333-7001. The Rio Crossing HOA has no authority to ticket or tow any vehicle for violation of state or city regulations. All members of Rio Crossing should have access to the Covenants, Conditions, & Restrictions – commonly referred to as the CC&Rs. If you have not been provided a copy, an unofficial copy of the filed document is available for free download. For a copy of the CC&Rs, go to the Maricopa County Recorder’s office web site search page, at https://recorder.maricopa.gov/recdocdata/. Enter 2004 in the year portion of the recording number, and 616015 in the next box, and press Search. Click on the “50” link in blue under the Pages column, and the document should appear. Here is a summary of the items related to parking from the CC&Rs, paraphrased slightly in some areas, with all references to Declarant language removed (it’s no longer applicable). Note there are specific definitions in the CC&Rs for capitalized terms. First, be parked in the garage on the Lot, to the extent space is available for parking. Second, if there is no space in the garage, then parked on the driveway that was originally constructed for the house. Third, If there is a driveway expansion constructed with the approval of the Design Review Committee and there is no space in the garage or in the original driveway. Lastly, if there is no space in the garage, in the original driveway, or in an approved driveway expansion, then a vehicle can be parked in the street. No vehicle can be parked in a driveway if the vehicle encroaches on or obstructs access across the sidewalk or curb adjacent to the driveway. Temporary parking of the vehicles of contractors, subcontractors, suppliers, and vendors is permitted. Temporary parking in the driveway on a Lot for recreational vehicles, motor homes, and similar vehicles for the purpose of loading or unloading is permitted. No vehicle can be parked on any part of the Common Area except a Street or a designated parking space. There are some related restrictions in the CC&Rs that aren’t specifically stated as “parking”. Anywhere on a Lot except in the garage. Anywhere on the Common Area. A vehicle can’t be constructed, reconstructed, or repaired on any Lot so as to be Visible From Neighboring Property. Can’t be constructed, reconstructed, or repaired on the Streets or any other part of the Common Area. Can’t be stored or parked on the Streets or any other part of the Common Area. There are also restrictions in section 4.1 of the CC&Rs relating to Residential Use. If the volume of parking generated results in congestion or is in excess of what is customary in a residential neighborhood, it might prohibit the owner from conducting a business activity on the Lot. There is a relatively inconsequential reference to parking in section 4.3 relating to Nuisances, stating that parking in connection with normal construction activities won’t be considered a nuisance. The final paragraph of section 4.12 states that the Board can make rules further restricting parking, but that those rules can’t conflict or be inconsistent with the other provisions of section 4.12. To my knowledge, there are no Board-adopted rules pertaining to parking in effect at this time. 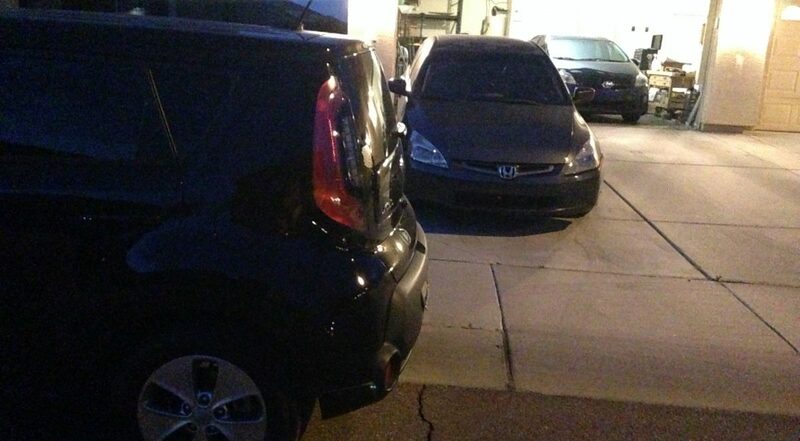 There are a few sections of Arizona Revised Statutes that cover parking. Here is the relevant text of ARS 28-873. Paragraphs not applicable to Rio Crossing (like parking near railroad tracks) has been removed for simplicity. Section 23-61 has the following limitations. (1) Displaying such vehicle for sale. (5) Parking in residential areas designated and posted as no parking areas pursuant to the city’s residential “no parking” program policy as adopted by the city manager or designee. No person shall park a vehicle upon any public street, right-of-way or other public property in residential areas if such public street, right-of-way or public property has been designated and posted as a residential no parking zone pursuant to the residential “no parking” program policy as adopted by the city manager or designee. Avondale code Section 23-63 repeats a good bit of ARS 28-873. Within fifteen (15) of a fire hydrant. Within twenty (20) feet to any crosswalk at any intersection. Within a designated fifteen (15) miles per hour school crossing zone. Within thirty (30) feet on the approach of any flashing beacon, stop sign, yield sign, or traffic control sign, or traffic control signal at the side of a street. On the side of a street unless both wheels on the right side of the vehicle are within eighteen (18) inches of a vehicle stopped or parked at the edge or curb of the street. On a street in the opposite direction of traffic flow. At any place where official signs prohibit standing or stopping. Except as specifically set forth below, no person shall stand or park a vehicle having both (i) a gross vehicle weight rating in excess of ten thousand (10,000) pounds and (ii) exceeding one (1) ton chassis rating, or a tractor, semi-trailer, trailer, bus, mobile home, recreational vehicle, farm implement, livestock trailer or similar equipment on a public street or in a parking lot of any retail, industrial, office, commercial establishment. Thank you for helping so much with all the research you did and how very straightforward this was written. Much appreciated.